Rodgers & Hammerstein’s 1949 musical is currently doing the rounds and retains much of its progressive nature. We may have grown accustomed to the use of swearwords on stage and screen – since Jerry Springer: the Opera, nothing surprises me anymore – but here Bloody Mary’s repetition of “stingy bastards” is at once funny and revealing. The language of the “SeaBees” – tame by today’s standards – gives the script an authenticity; I won’t say “realism” because it’s a musical, for gawd’s sake. The score is the star. So many of the songs have leached into popular consciousness: “Going To Wash That Man Right Out of My Hair”, “There is Nothing Like a Dame”, “Happy Talk” and the sublime “Bali Hai” and “Some Enchanted Evening.” Romantic, dramatic and funny, the score lifts the story of American naval forces stationed on a tiny island during World War Two into something to which we can all relate. There is a bit of plot about a behind-enemy-lines mission and a love story between a nurse, Ensign Nellie Forbush and a French planter (a man not a flowerbed). 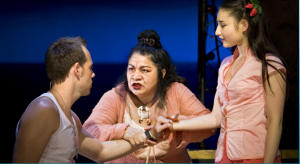 The twist is she has a wobble when she discovers he has two kids from his first marriage, and when she realises the deceased first wife was a native of the islands and had dark skin, our sympathies towards her are tested. The show challenges the idea of racism as something innate. The song “You’ve Got To Be Carefully Taught” could easily be the anthem for anti-hatred campaigns today. This is a musical with sweeping romance, peril and real depth, much like the eponymous ocean. As Nellie Forbush, Rebecca Thornhill sings well and presents a likeable character – until her prejudices are revealed. She becomes a more abashed figure as she tries to make amends, befriending the mixed race children when it is presumed their father has been killed. Matthew Cammelle’s Emile De Becque has a rich, deep voice that is like being drowned in dark chocolate. His “Some Enchanted Evening” was a highlight for me. I also took to Loretta Ables Sayre plodding around the stage as Tonkinese opportunist Bloody Mary. She provides most of the comic relief yet her bewilderment at her daughter’s abandonment by the American lieutenant is surprisingly touching. Stand-out in my view is Alex Fearns as irrepressibly cocky wide boy Luther Billis, an energetic and endearing performance: his gravelly voice and brassy demeanour mask his genuine affection for Nellie Forbush. The final moments of reunion and reconciliation between Nellie and Emile were a little too understated, I found. Tacit acceptance and domesticity didn’t sweep me away in a wave of romance.